The meter on the left records 1 KW generated. The power generation system of course starts with the solar panels located on the roof. They generate DC power that is fed to the inverter (on the right side of the image). The Inverter converts the DC form of power to AC. The AC power is then fed into the grid via the Output meter (or the Generator Meter). 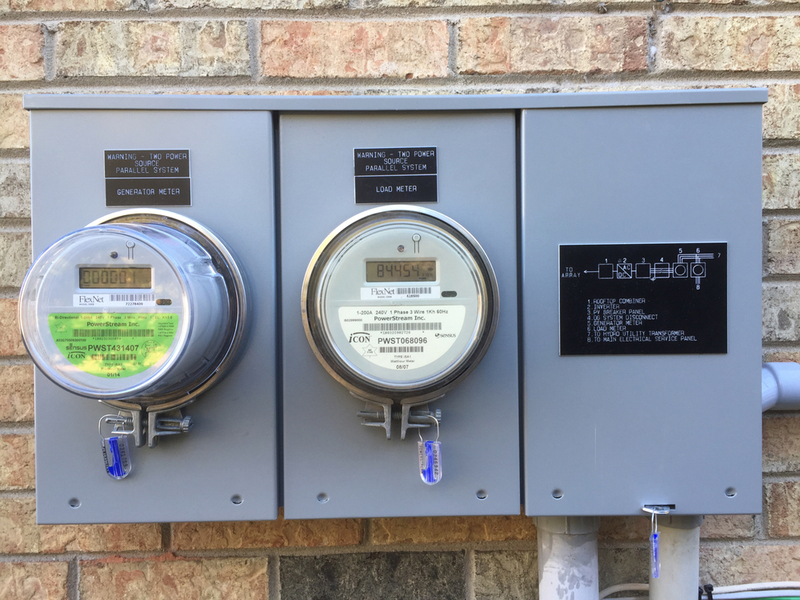 The Output meter reports how much power we supply to the grid. First couple hour's generation report. As a memento I have recorded the output meter at 1 kWh (click on the image above). I assume that 1 kW is from testing the meter. As of the end of day we had generated 419 watts. Not a lot, but it was operational for only a couple of hours on a cloudy, November day. The inverter has a wifi connection that allows me to connect to it and monitor in real time the power generation. I expect to spend several hours each day closely monitoring the generation status. I hope it has real-time alerts. There is also an iPhone App which I hope to figure out how to use. In that way, I can monitor the generation status from anywhere in the world at any time. The information is also fed to an aggregator (located somewhere in the cloud) who generates various reports, which I hope includes presentations in the form of pie charts. In my imagination, these data contribute to a massive big data infrastructure that are used in some way to make this Earth a much better place. That is what I imagine. Just one step remains and that is the installation of the squirrel guard to protect the solar panels and the wiring. As is well understood by the cognoscenti, it is not nuclear war or terrorists that will bring down the North American grid, it is squirrels. While this installation is expected to generate over 60% of our annual electrical needs, in the overall scheme of things the significance is unclear as the actual contribution is very minor; the amount of green energy produced is just a few mega watts; the carbon offset is in terms of just a few tonnes. But it does seems fitting for one who thinks of himself as a photographer to use light to generate power as well as images.